As I wrote up the pattern for Radio Waves and took a good look at the top I made, I was uneasy. Why? Well, it wasn't quite as big as I had wanted from the beginning. If I actually knew very many people who had "full" sized beds, it'd be one thing, but almost everyone I know has a queen size bed (couples). So, the other day I added one row, and then a couple days later I went ahead and made up the extra blocks I needed to finish making the top about 101"x101". 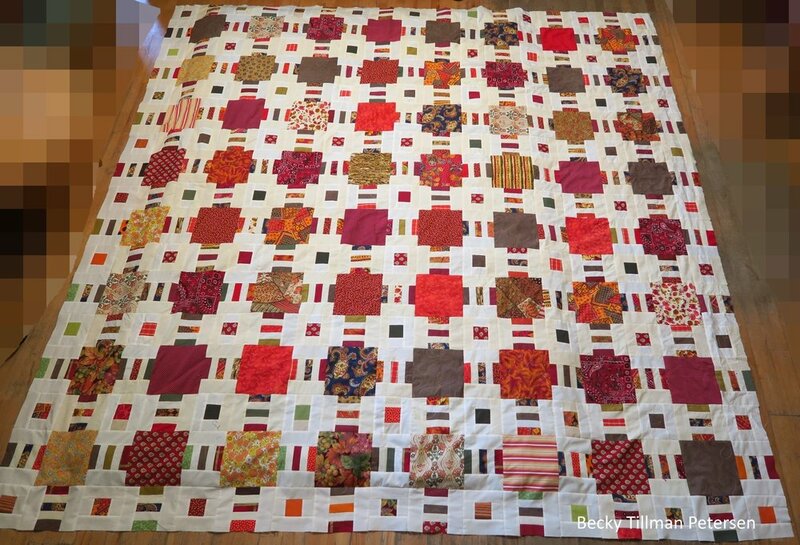 When I quilt it, it will shrink a few inches down into the 90s"x 90s" - not sure the amount. That depends mostly on the batting I use, and the complexity of the quilting, I believe. I've updated the pattern to show what I actually am making. While I was at it, I found a couple of pretty basic mistakes. I hope you re-download this pattern if you've already gotten it as this one is better! I've been working on yet one more quilt using these same fabrics - so hopefully soon you will see that one! Have a wonderful day wherever this finds you reading!